Step up to the plate and put your build skills to the test with this DIY VEX Penguin Challenge! What better way to spend a cold January day indoors than by helping your child build this DIY VEX penguin? Gather up your VEX pieces and build your own feathery friend! Setup the connectors for step 2 by placing two black 0x2 Connector Pins in two white Small Chassis Corner Connectors. Place two black 0x2 Connector Pins in two black Small Chassis Corner Connectors. Add 4 white 0x2 Connector Pins into 4 black Small Chassis Corner Connectors. 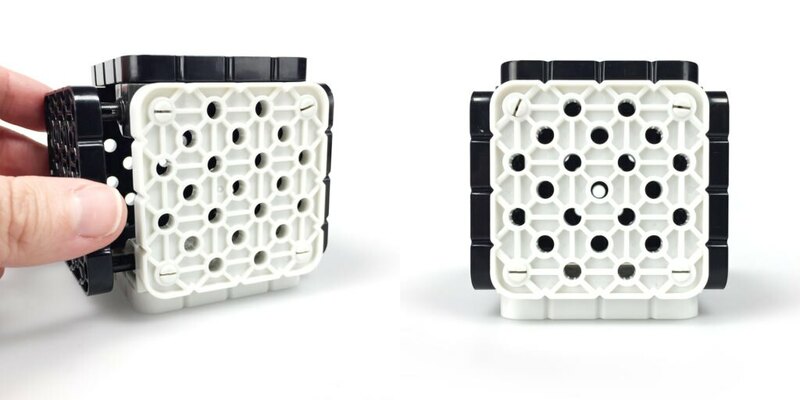 Connect two black Chassis Corner Connectors with white pins to the top corners of a 4×4 white plate. The white pins should be connecting the two pieces. Attach two white Chassis Corner Connectors with black pins to the bottom corners of the plate. The left corner should have the black pin facing left while the right corner should have the black pin facing right. Take a 4×4 black plate and attach two black Chassis Corner Connectors with black pins to the top corners of the plate. This will be the back of the head. Take a 4×4 white plate and attach two black Chassis Corner Connectors with white pins to the top corners of the plate. The white pins should be connecting the pieces. Connect the black plate to the black Chassis Corner Connectors of the base. Connect the white plate to the white Chassis Corner Connectors of the base. The two plates should be opposite of each other. Make sure the Connector Pins and Small Chassis Corner Connectors are set up like the picture above. This will help the pins to not be seen in the final product. Use three 4×4 black plates to close up the sides and the top so that it makes a box. 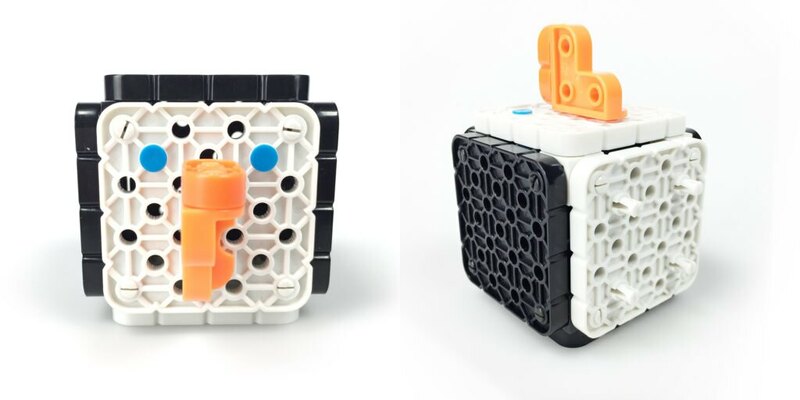 Connect the 1×2 orange beam and the orange Large Chassis Connector and place it in the center of the white side of the box. This will be the beak of the penguin. For the eyes, place a blue 0x2 Connector Pin on either side of the beak. Take the four white 1×1 Connector Pins and put them on the bottom side of the head. These will be used to connect the head to the body later on. Place four black 0x2 Connector Pins in the corners of the third row from each side of the 4×8 black plate. Repeat this step for the 4×6 black plate. Place the 4×4 black plate on top of the 4×6 black plate so that the connector pins fit into the corners of the 4×4 plate. Connect this to the 4×8 black plate so that the pins fit into the corners of the 4×6 plate. Add a white Chassis Corner Connector with a Black 0x2 Connector Pin to the top left corner of the 4×8 side of the wing. Make sure the black pin is the pin connecting the two pieces. Attach a black Chassis Corner Connector that has a white pin to the top right of the wing. The white pin should face the top. Attach a black Chassis Corner Connector that has a white pin to the bottom left of the wing. The white pin should face the left side of the wing. Add a black Chassis Corner Connector with a black pin to the bottom right of the wing. The right wing will reflect the left one. Attach a black Chassis Corner Connector that has a White 0x2 Connector Pin to the top left of the 4×8 side of the wing. Add a white Chassis Corner Connector with a black pin to the top right corner of the wing. Add a black Chassis Corner Connector with a black pin to the bottom left of the wing. Attach a black Chassis Corner Connector that has a white pin to the bottom right of the wing. The white pin should face the right side of the wing. Lay a 4×8 Black Plate in between the two wings. Attach the wings to the corners of the 4×8 plate. Black pins should be connecting the wings to the plate while the white pins are facing up. Connect a 4×4 white plate to the top. Attach a 4×8 white plate to the middle. Add a 4×4 black plate to the bottom. Connect the orange 1x Wide, 1×1 Offset Corner Connector to the orange 2x Wide, 2×1 Corner Connector to make the feet. The feet will connect to the end with the black 4×4 plate. Place the feet in the third row from the back. Place the head to the 4×4 white plate side of the body. Can you build a better penguin than HEXBUG? Challenge us on social media by tagging @hexbug and using #HEXDIY on your post. The possibilities are endless with VEX Robotics pieces. Let us know in the comments what VEX build you’d like next.